In the wake of Dubai’s hosting the World Expo 2020, the leading Emirate has seen a myriad of mega-construction projects aiming to showcase the accomplishments of the nation. It seems that there was room for an additional project as the state-owned investment company, Dubai Holding, has released details of a 550-meter supertall tower set to surpass the One World Trade Center in New York, USA. In an effort to consolidate the country’s tourism profile with staggering landmarks, Burj Jumeira, Dubai’s newest rising tower, has been introduced. The tower is situated in Al-Sufouh residential area in Dubai, in the vicinity of Burj Al Arab, and will be surrounded by a mixed-use residential and commercial zone that will be named “Downtown Jumeirah”. Dubai Holding, in a press release, has announced that the construction is set to begin immediately, with the completion of the first phase in 2023. The architectural design is a work of art with the inspiration behind it being desert dunes, as well as oasises, that are hallmarks of the Arabian desert. In addition to the awe-inspiring observation deck offering a 360 view of the city, it will also feature a platform 450 meters high with a sky lounge and a restaurant. 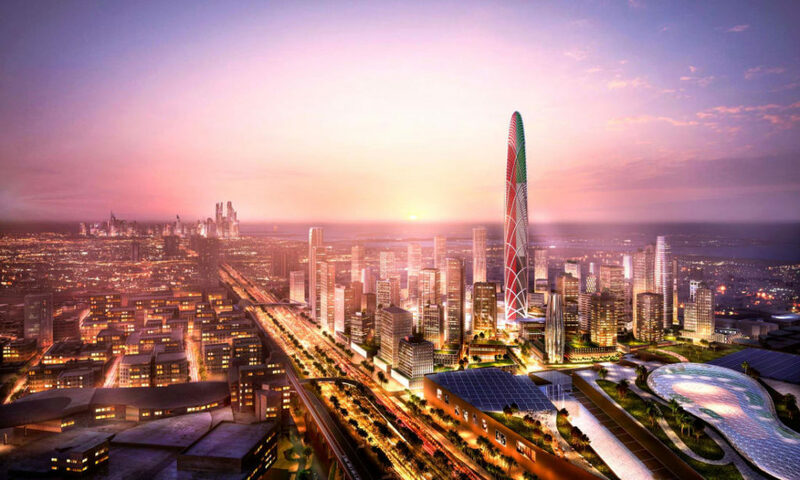 But perhaps, the most iconic feature of this magnum opus is that its base is designed in the outline of Dubai’s Ruler, Sheikh Mohammed bin Rashid’s fingerprint. It’s also worth mentioning that there are plans for an amphitheater as well as various cultural events. The whole thing is a stroke of creativity that is rather inspiring. Similar to Burj Khalifa, the world’s tallest tower, Burj Jumeirah will be covered in a digital display system capable of lighting up the whole tower in different shapes and colors. According to the Council on Tall Buildings and Urban Habitat, Burj Jumeirah, once it is inaugurated, will be the 13th supertall tower dominating the skies of Dubai. WE SAID THIS: Dubai will soon be the world’s number one city with the most skyscrapers!